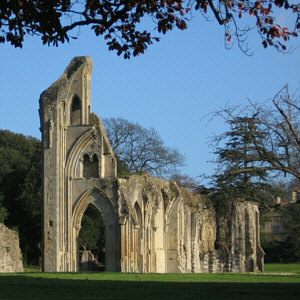 Theosophy Cardiff:- Glastonbury Abbey, Glastonbury, Somerset, England. Glastonbury may have been a site of religious importance in pre-Christian times. The abbey itself was founded by Britons, and it dates at least to the early 7th century. Later medieval Christian legend claimed that the abbey was founded by Joseph of Arimathea in the 1st century. This fanciful legend is intimately tied to Robert de Boron's version of the Holy Grail story and to Glastonbury's connection to King Arthur, which dates at least to the early 12th century. Glastonbury fell into Saxon hands after the Battle of Peonnum in 658. The Saxons under Cenwalh of Wessex conquered Somerset as far west as the River Parrett, perhaps with the intention of gaining control of the valuable abbey. However, Cenwalh allowed the British abbot, Bregored, to stay in power, a move perhaps intended as a show of good faith to the defeated Britons. After Bregored's death in 669, he was replaced by the Anglo-Saxon Berhtwald, but British monks remained for many years after. King Ine of Wessex enriched the endowment of the community of monks already established at Glastonbury. He is said to have directed that a stone church be built in 712, the foundations of which now form the west end of the nave. Glastonbury was ravaged by the Danes in the ninth century. The contemporary reformed soldier Saint Neot was sacristan at Glastonbury before he went to found his own establishment in Somerset. The abbey church was enlarged in the tenth century by the Abbot of Glastonbury, Saint Dunstan, the central figure in the tenth-century revival of English monastic life, who instituted the Benedictine Rule at Glastonbury. Dunstan became Archbishop of Canterbury in 960. Dunstan built new cloisters as well. In 967, King Edmund was laid to rest at Glastonbury. In 1016 Edmund Ironside, who had lost England to Canute but held onto the title of King of Wessex, was buried there too. King Cnut's charter of 1032 was "written and promulgated in the wooden church at Glastonbury, in the kings presence". At the Norman Conquest in 1066, the wealth of Glastonbury made it a prime prize. The new Norman abbot, Turstin, added to the church, unusually building to the east of the older Saxon church and away from the ancient cemetery, thus shifting the sanctified site. Not all the new Normans were suitable heads of religious communities. In 1077, Thurstin was dismissed after his armed retainers killed monks right by the High Altar. 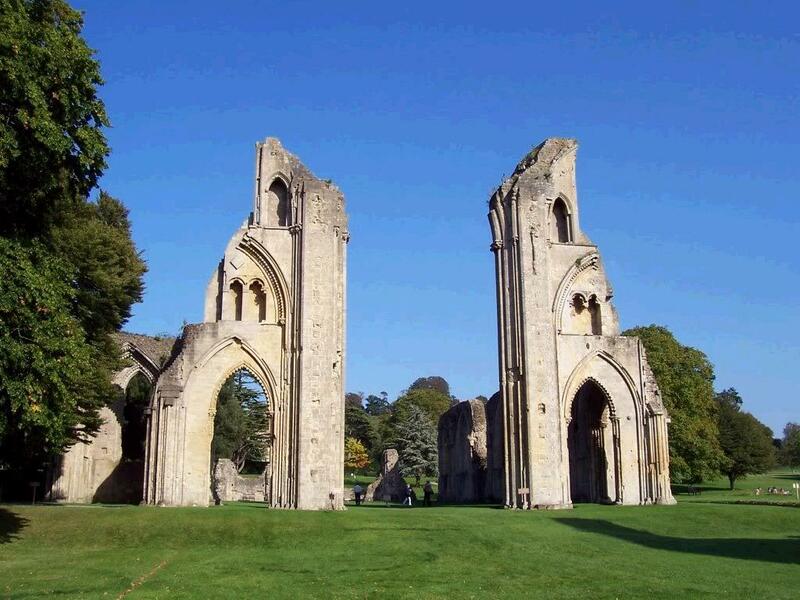 In 1086, when Domesday Book was commissioned, Glastonbury Abbey was the richest monastery in the country. Abbot Henry of Blois commissioned a history of Glastonbury, about 1125, from the chronicler William of Malmesbury, whose De Antiquitate Glastoniensis Ecclesiae is our source for the early recorded history, and much awe-inspiring legend as well. Then as now, legend worked more strongly than raw history to bring the pilgrims who sustained the Abbey's reputation and contributed to its upkeep. Purported site of King Arthur and Queen Guinevere's tomb beneath the high altar In 1184, a great fire at Glastonbury destroyed the monastic buildings. Reconstruction began almost immediately and the Lady Chapel, which includes the well, was consecrated in 1186. There is evidence that, in the twelfth century, the ruined nave was renovated enough for services while the great new church was being constructed. If pilgrim visits had fallen, the discovery of King Arthur and Queen Guinevere's grave in the cemetery in 1191 provided fresh impetus for visiting Glastonbury. According to two accounts by the chronicler, Giraldus Cambrensis, the abbot, Henry de Sully, commissioned a search, discovering at the depth of 16 feet (5 m) a massive hollowed oak trunk containing two skeletons. Above it, under the covering stone, according to Giraldus, was a leaden cross with the unmistakably specific inscription Hic jacet sepultus inclitus rex Arthurus in insula Avalonia ("Here lies interred the famous King Arthur on the Isle of Avalon"). Five years later, in 1197, Savaric FitzGeldewin, bishop of Bath and Wells, persuaded Pope Celestine III to allow the annexation of Glastonbury Abbey to his diocese. He officially moved his Episcopal seat there, but the monks would not accept their new Bishop of Glastonbury and he was kept away from the abbey. The bishops continued to use the title Bishop of Bath and Glastonbury until finally renouncing their claim to Glastonbury in 1219. Services in the reconsecrated Great Church had begun on Christmas Day, 1213, most likely before it was entirely completed. King Edward I and Queen Eleanor attended the magnificent service at the reburial of King Arthur's remains to the foot of the High Altar in 1278. In the 14th century, only Westminster Abbey was more richly endowed and appointed than Glastonbury. 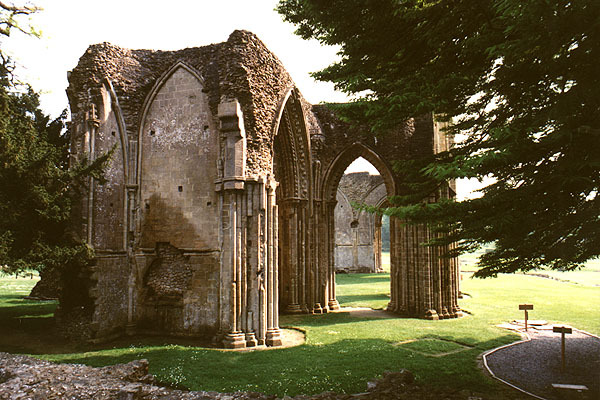 The abbot of Glastonbury kept great state, now attested to simply by the ruins of the abbot's kitchen, with four huge fireplaces at its corners. 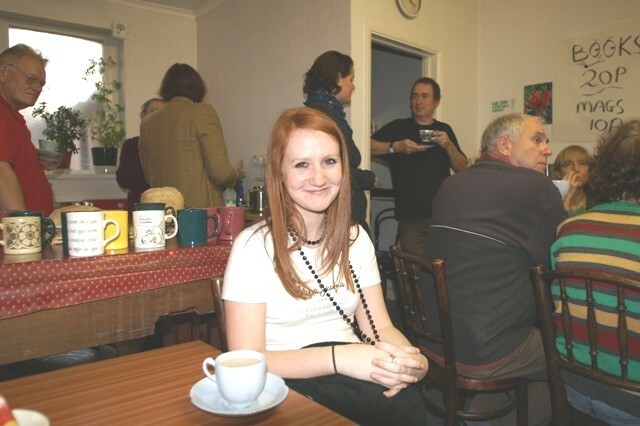 The kitchen was part of the magnificent Abbot's house begun under Abbot John de Breynton (1334–42). It is one of the best preserved medieval kitchens in Europe, and the only substantial monastic building at surviving at Glastonbury. Archaeological excavations have revealed a special apartment erected at the south end of the Abbot's house for a visit from Henry VII, who visited the Abbot in a royal progress, as he visited any other great territorial magnate. The conditions of life in England during the Wars of the Roses became so unsettled that a wall was built around the Abbey's precincts. 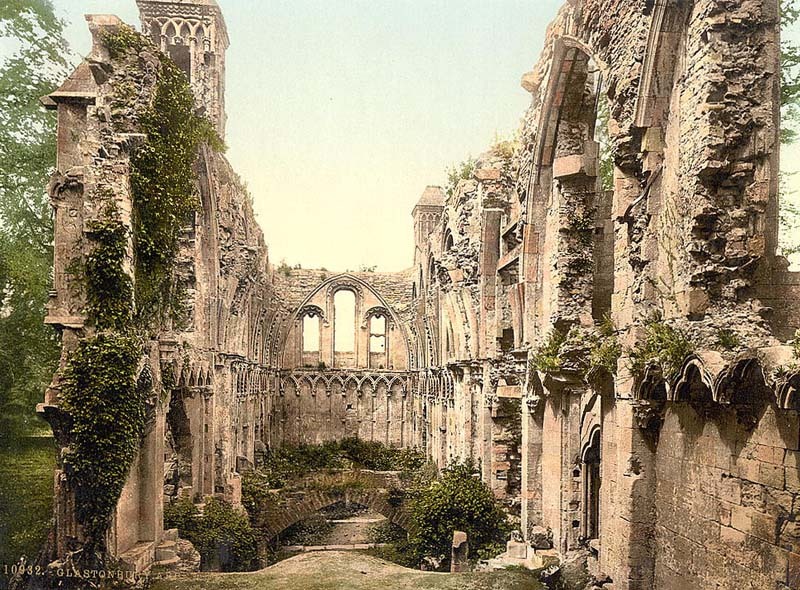 At the start of the Dissolution of the Monasteries in 1536, there were over 800 monasteries, nunneries and friaries in England. By 1541, there were none. More than 15,000 monks and nuns had been dispersed and the buildings had been seized by the Crown to be sold off or leased to new lay occupiers. Glastonbury Abbey was once more a rich plum. In September 1539, the Abbey was stripped of its valuables and Abbot Richard Whiting (Whyting), who had been a signatory to the Act of Supremacy that made Henry VIII the head of the church, resisted and was hanged, drawn and quartered as a traitor on Glastonbury Tor on November 15, 1539. After the Dissolution, two of the Abbey's manors in Wiltshire were sold by the Crown to John Thynne and thereafter descended in his family, who much later became Marquesses of Bath. The Thynnes have preserved many of the Abbey's Wiltshire records at Longleat up to the present day. 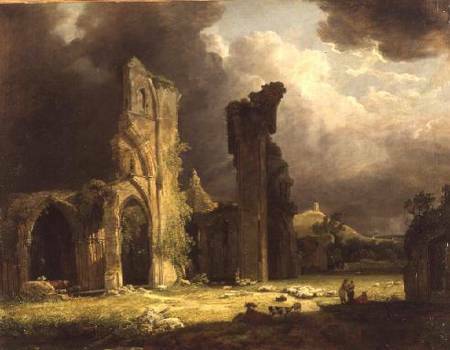 By Shakespeare's time, two generations later, Glastonbury was one of the "bare ruin'd choirs Where late the sweet birds sang." One of the earliest surviving manuscripts, now at the Bodleian Library, telling that Dunstan the abbot gave orders for the writing of this book.The Abbey library was described by John Leland, King Henry VIII's antiquary who visited it, as containing unique copies of ancient histories of England and unique early Christian documents. It seems to have been affected by the fire of 1184, but still housed a remarkable collection until 1539 when it was dispersed at the Dissolution of the Monasteries. Some of the manuscripts from Glastonbury have been traced. 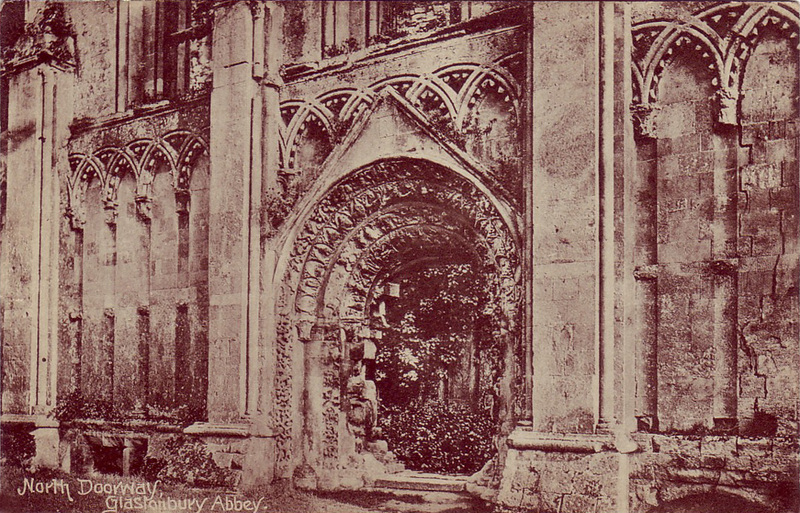 The ruins of Glastonbury Abbey were purchased by the Bath and Wells Diocesan Trust in 1908. The ruins are therefore now the property of the Church of England. On acquiring the site the Church appointed Frederick Bligh Bond to direct an archaeological investigation. 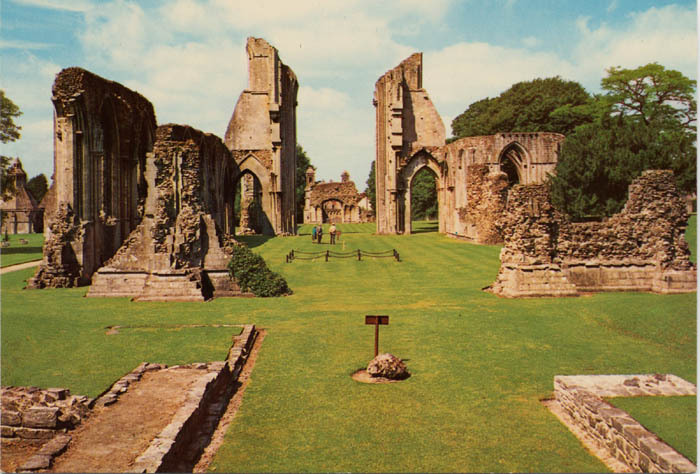 A pilgrimage to the ruins of Glastonbury Abbey was held by a few local churches in 1924. Pilgrimages continue today to be held; in the second half of June for the Anglicans and early in July for the Catholics and they attract visitors from all over Western Europe. Services are celebrated in the Anglican, Roman Catholic and Eastern Orthodox traditions. The ruins of the great church, along with the Lady Chapel is a grade I listed building, set in 36 acres (150,000 m2) of parkland and open to the public. It is approached by the Abbey Gatehouse which was built in the mid 14th century and completely restored in 1810. The 14th century Abbey Barn is also open to the public, outside the walls, as part of the Somerset Rural Life Museum.